Independent Filmmaking around the Globe calls attention to the significant changes taking place in independent cinema today, as new production and distribution technology andshifting social dynamics make it more and more possible for independent filmmakers to produce films outside both the mainstream global film industry and their own national film systems. Identifying and analyzing the many complex forces that shape the production and distribution of feature films, the authors detail how independent filmmakers create work that reflects independent voices and challenges political, economic, and cultural constraints. 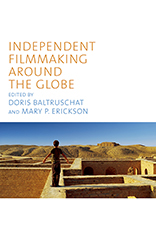 With chapters on the under-explored cinemas of Greece, Turkey, Iraq, China, Malaysia, Peru, and West Africa, as well as traditional production centres such as the United States, the United Kingdom, Canada, and Australia, Independent Filmmaking around the Globe explores how contemporary independent filmmaking increasingly defines the global cinema of our time. Yannis Tzioumakis; Teresa Hoefert de Turégano; Erik Knudsen; Mark Ryan; Gabriela Martínez; Lydia Papadimitriou; Murat Akser; Mary P. Erickson; Hongwei Lu; Martin Mhando; Gaik Cheng Khoo; Doris Baltruschat and Sheila Petty.